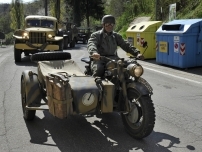 On Amazon website is available the second edition of a guide to WWII sites in Italy was published. It includes a chapter about battlegrounds and monuments to the 10th Mountain Division and Brazilian forces in the Apennines. The museum contributed to this chapter by giving its author, Anne L. Saunders, a tour of selected local sites. The trilogy of the 10th American Mountain Division in Italy. By Davide Mori and Giovanni Sulla in collaboration with Andrea and Giuliano Gandolfi, Curators of the Museum System of Iola di Montese. Photographs of places and people compared between 1945 and today, along the advance of the U.S. 10th Mountain Division’s soldiers in Italy, from the Gothic Line to Lake Garda and the border with Austria. After the books, by Andrea e Giuliano Gandolfi, In My Father's Foxholes and Footsteps, which indelibly imprint on a book memories and original photographic testimonies by Cruz Rios, soldier of the 10th Mountain Division, and in the following publication Gothic Line Bloody Red, where inside they found space: the history of the only Americans Division of Mountaineers together with the memoirs of officers, non-commissioned officers and soldiers of the division as well as other original photographic testimonies in color taken between the Gothic Line, Lake Garda up to the border with Austria, now is published .... 1945. 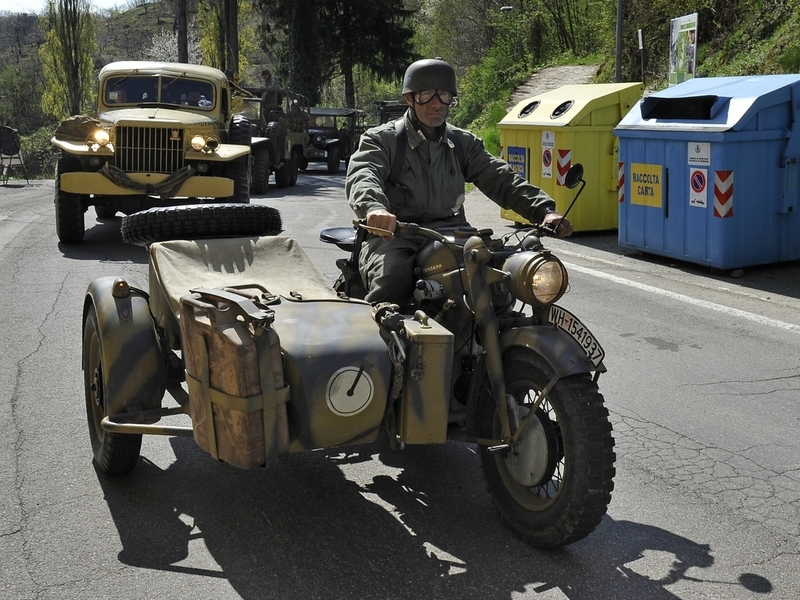 The U.S. 10th Mountain Division in Italy. Then and now. This photographic book compares people and places portrayed in the now distant 1945 with the same places and, in some cases people, nowadays. The reader can observe the photos of a territory battered and torn by conflict, compared to those of the same places in our day, suddenly become an oasis of peace and beauty. What amazes even more is the ability to identify children and young people, portraits in the photos of the time, turn into a moment in adults today. People who have not made mention of those events, sometimes for years, or that have instead handed down, in a discreet way to the loved ones, stories of events from the unthinkable tragedy. So unique and incredible that it would probably be worthwhile to collect them in as many individual works, to be saved forever on that fascinating and irreplaceable object to be helding in the hands that is a book. All photographs are Geotagged. The points in which they were taken are identifiable with the GPS of your smartphone. The second edition of the book Gotica Rosso Sangue, published in Montese (Modena) in May 2018 by the publisher Il Trebbo, consists of 192 pages of which 82 are dedicated to color photographs, compared to 152 pages of which 76 are photographs, of the first edition. 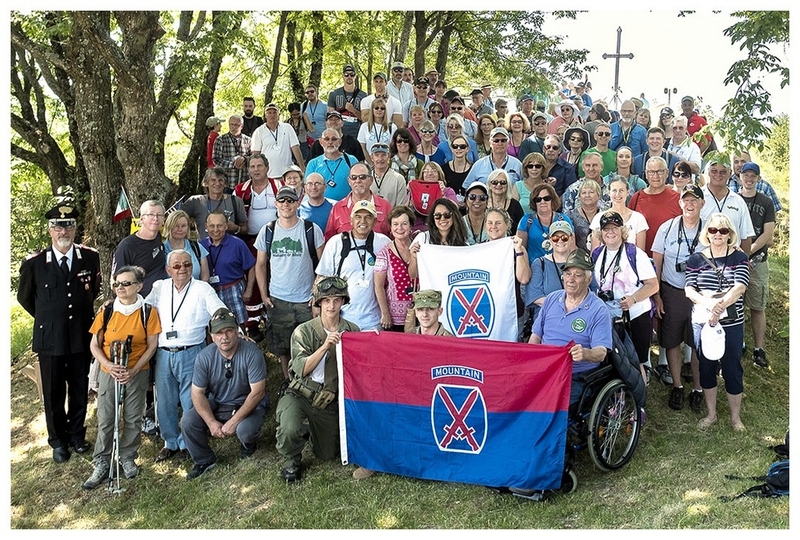 The spirit of this book, ten years after the previous publication In My Father’s Foxholes and Footsteps, is focusing on the memories and photos by Cruz Rios, Company K, 87th Regiment, US 10th Mountain Division in 1943/1945, follows the same motivations. Gothic Line Bloody Red takes life from another collection of color photographs which crossed the atlantic Ocean thanks to Stephanie, wife of William Ferguson in force, in 1945, to the medical detachment of 2nd Battalion, 86th Regiment which allowed us to use them for this book, and Val Rios. As in the previous book this photographic heritage, set with memories of officers and a soldier of the 10th Mountain Division, could not go forgotten - or lost - because it is a testimony of a dark chapter but certainly the most important in the recent history of our country. More than in black and white, the numerous color photos pass on aspects of life and places so changed as to be unrecognizable or unknown to the younger generation. 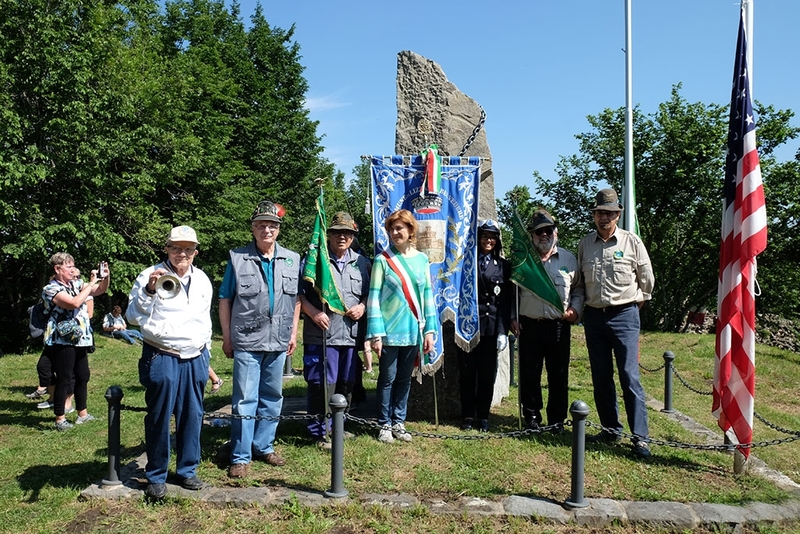 Of this first and only “Alpini” Division of the American Army, framed in the V American Army and deployed in front of the German soldiers of the 232nd Infantry Division that defended the second line of defense of the Gothic Line on high ridges Apennines between the provinces of Bologna, Modena and Pistoia, has relatively little spoken in Italy and especially in a piecemeal way ignoring the overall picture; this is why the first chapter is devoted to the history, until 1945, of the 10th Mountain Division. Compared to the first edition, the first chapter of Fred Wendorf's memoirs has been extended with additional original contributions and a fifth chapter of memories of the Commander of the 126th Engineer Mountain Battalion has been added. The book contains the memoirs of three Officers, a Non-Commissioned Officer and a Soldier of the 10th Mountain Division. The last chapter is dedicated to the Iola di Montese' Museum: Memorie d’Italia 1939-1945. The collections of equipment, uniforms, weapons and objects used daily by soldiers of the opposing armies well reflect the weaknesses and strength of the respective technologies, logistics and industries of the belligerent nations. Two rooms of the museum, recognized in partnership by the Association of 10th Mountain Division Descendant, are dedicated to the U.S. Army soldiers with emphasis on the specific equipment of the “Mountaineer”. The book, whose texts are bilingual in Italian and English, consists of 192 pages of which 82 are dedicated to color photographs, 63 are unpublished, taken between May and August 1945. Last but not least, the proceeds of this book will be a contribution to the construction of the new Museum Memorie d’Italia where will be transferred and housed, in a manner best suited, the collections of World War II. The book, whose texts are both Italian and English, consists of 152 pages of which 76 are dedicated to the color photos, 59 are unpublished. One chapter focuses onto the history of the 10th Mountain Division until November 1945, date of its inactivation. Three new and modern satellite-based maps showing the path of the Division from the Gothic Line up to the border with Slovenia passing by Lake Garda. Four chapters are dedicated to the memories of two officers, one NCO and a soldier of the 10th Mountain Division. One chapter focuses onto the collection of unpublished color photographs taken between May and August of 1945. A chapter contains photographs of the halls of the Iola di Montese museum, officially recognized by the 10th Mountain Division Descendant, Inc. The last chapter of the appendices contains some in-depth articles, one by Blizzard of March 24, 1945. 1945. The U.S. 10th Mountain Division in Italy. Then and Now. Gothic Line bloody red. Second edition. Study the past if you want to determine the future. History is testimony of the past, light of truth, life of memory, teacher of life, announcer of ancient times. A generation that ignores history has not past and is without a future. Tradition does not consist in keeping the ashes but keeping a flame alive. Nothing is more alive than a story when history belongs to us. And from there you recognize a road, a sky, a time that flows, things and faces. There is no history older than the memory, when it is said once upon a time. 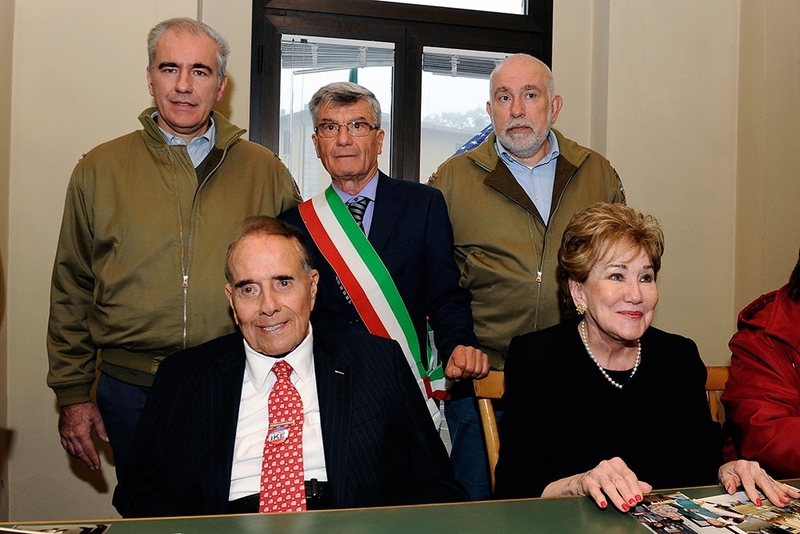 A tour to the battlefields of the 10th Mountain Division between Monte Belvedere, the Iola di Montese museum and the place where Bob Dole was wounded. Too bad for the missed visit to Monte Belvedere: bad weather. The classic "light lunch" could not be missing. The trip (amazing .. https://www.nationalww2museum.org/…/liberator-aboard-legend…) was organized by the National Museum of WWII in New Orleans. Among the others participants in the tour: the Veteran Mr. Paul Hilliard, the Governor Christine Whitman and the Ambassador Ken Blackwell. Great friendship and esteem with the writer Alex Kershaw. The Iola museum donated a WWII American soldier helmet to the museum of New Orleans. It was found many years ago in Mt della Torraccia area. The activities of the museum relies on volunteers and donations. Your donation can help us so the new and future generations can learn from their past. The museum and this website are both purely historical and have no ideological or political address. A voyage into the past through Memories of Italy. 150 years of history collections into 16 themed rooms, an area of 600 square meters and an exhibition of more than 4,000 objects. Copyright © 2006-2019. Andrea and Giuliano Gandolfi. All rights reserved. Questo sito utilizza i cookie. Se vuoi saperne di più clicca qui.